Lake Louise is certainly one of the top vacation destinations in the Canadian Rockies and Banff National Park. But once you’ve gotten your fill of this amazing vacation spot, you may want to do some exploring. We highly recommend taking a scenic drive down the Icefields Parkway, from Lake Louise up to Jasper. 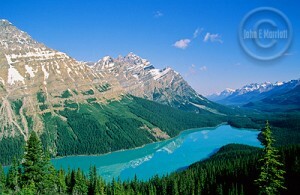 Peyto Lake is one of the great views driving from Lake Louise on Icefields Parkway. Just because we’re calling this a “scenic drive” doesn’t mean you’ll be sitting in your car the whole time. There are plenty of sights to see and short hikes to be had en route to the famed Athabasca Glacier. Here’s a quick guide to this drive to help you find the best stopping points along the way. Picnic it: The areas around the Icefield Parkway are some of the most scenic in Banff and Jasper National Park, so you should definitely plan on packing a great picnic to eat in the outdoors, while you take in the beauty. There are designated picnic areas at Herbert Lake, Saskatchewan River Crossing, Bow Lake and below Mt. Coleman. Or bring a blanket and find a quiet place at a trail head or one of the campgrounds. Get some gifts: Crossing Resort’s Gift Shop offers a bunch of cool postcards to send to friends and relatives, and they also have a great ice cream stand. Take a driving break and sample some of the Canadian Rockies goods in the store. See the wild things: The Icefields Parkway from Lake Louise are a terrific place to see wildlife, especially in late spring and early summer when there’s still snow in the high elevations. The best times are usually early in the morning, or just before sunset. Keep a sharp eye out, don’t go anywhere near them, and bring a guide book to help you identify any wildlife you may encounter. Read the signs: Many of the rest stops have signs that explain geological features and the historical importance of the view. Use this as a great opportunity to stretch your legs and learn about Lake Louise and the surrounding Canadian Rockies. A good stop to make is at the Bow Summit which offers a short walk to the peak and a great view of Peyton Lake nestled between the surrounding mountain ranges. You will meander through high elevation meadows which are blooming with wildflowers during the early summer months. Another great place to observe wildflowers is the ten minute walk into Mistaya Canyon. Also, check out the start of the Glacier Lake trail to observe the banks of the North Saskatchewan River. Things to think about: During the winter months, make sure you have a full tank of gas, food, water and plenty of warm clothing. All services along the Icefield Parkway close for the winter season.